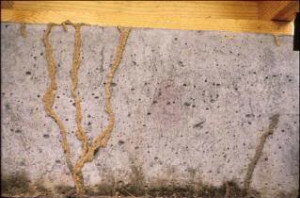 Subterranean termites are the most destructive kind of termite. Coming from deep underground, these pests invade houses and eat away at just about any kind of wood they can find. If you are unlucky enough to have a subterranean termite infestation in your home, you will definitely want to get rid of them ASAP. Find out how. Subterranean termites are a type of insect found mostly in Hawaii, the Gulf States (Texas, Louisiana, Mississippi, Alabama, and Florida), and Southern California. They dislike colder climates, so most other states in the US are not affected by these destructive pests. 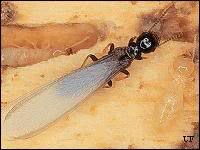 These termites live in large colonies with a queen, a king, and thousands of workers. 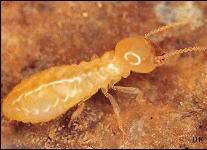 Subterranean termite kings and queens have a white appearance as pictured above in Image A. Image B shows subterranean termites in their "winged reproductive" stage. Subterranean termites have a unique (and uniquely annoying) behavior. They build tunnels of mud mixed with saliva, extending as long as 50-60 feet, which connect their nests in the soil to the wood in structures like the foundation of your home. They often get into a building through expansion joints in concrete slabs or where utilities enter the house. These unwelcome guests then proceed to eat through any wood they find (as well as other items containing cellulose – namely, paper, fiberboard, and even some fabrics). Spotting a termite. A single termite (or even a few) flying around your home does not necessarily mean that you have an infestation … but it very well might. Noticing piles of wings. This signals a more serious problem. It's definitely time to contact a qualified exterminator. Mud tubes. Subterranean termites don't hide their tunnels. In fact, you may spot them on the exterior concrete walls of your home, on the basement ceiling, in the attic, or anywhere else in your home. If you find even one small mud tube, have a professional inspection to find out just how complex the problem is. Damaged wood. If you suspect a certain area of your home has been invaded by termites, perform a quick check to see whether the wood has been invaded and damaged. Start with a visual inspection for the characteristic “layered” look of wood that’s been damaged by subterranean termite infestation. Next, knock on the wood. A hollow sound is a sign of termite invasion. Finally, test with a screwdriver. If the screwdriver tip easily enters the wood, then it's clearly been eaten away by termites. The key to getting rid of subterranean termites is poisonous termite bait, strategically placed by a pest control expert. Because termites will take it back to their colony, termite bait work to kill off the entire colony -- not just the termites on the surface, as a spray insecticide would. Baiting can be a slow process, which may take 6 months or longer to work. 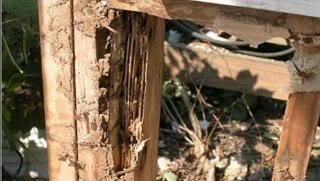 You may also need to have the baits placed and replaced several times before your home is finally termite-free. Whew!